Name the top 5 container orchestration solutions. The rise of Kubernetes as the leading container orchestration tool should come as no surprise. It’s the topic of the day with Amazon and Microsoft recently joining the CNCF. In a few short years, we’ve seen hundreds of companies join the ecosystem building or modifying solutions to support kubernetes (check out the recently updated CNCF Landscape) and we’ve even seen the early days of acquisitions beginning to happen. With all that is being said and written, it’s still good to back up a trend with some good old-fashioned data. 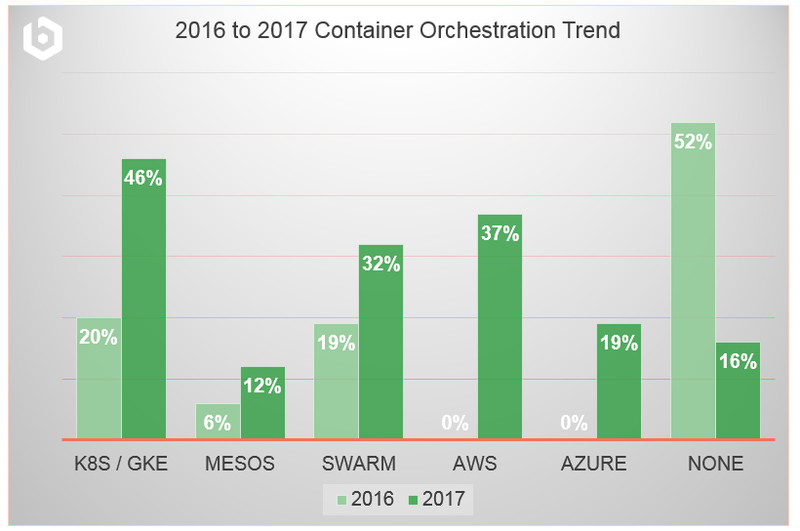 As promised (see Container Trend Part 1), in our second post covering our recent user survey we’re taking a look at container orchestration trends. In our last blog post, we showed the increase in interest, highlighting a more than 2x increase in production container usage from 2016 to 2017. As that increase in container usage was happening, what impact did that have on how containers were being managed? Of course, we’d expect some increase in usage of container orchestration to match that growth. 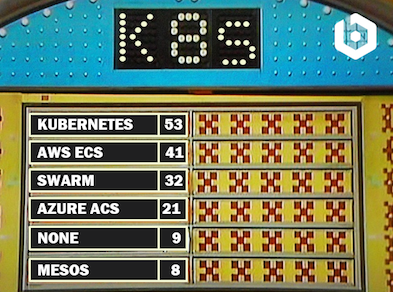 We asked our users “What Container Orchestration System(s) does your company use?” and the results were surprising in a few ways. First and foremost was the enormous growth of Kubernetes. And while Mesos usage doubled, it still pales in comparison to new entrant offerings like AWS Elastic Container Service and Azure Container Service. Docker Swarm showed significant growth over that period as well, perhaps due to Swarm being included in the Docker 1.12 release. 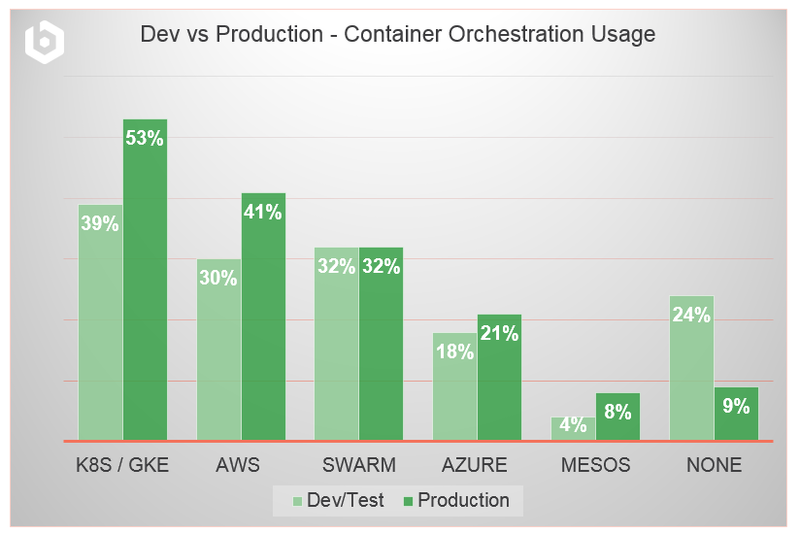 The least surprising bit of data was the sharp decline in users with no container orchestration, which is supportive of the shift from dev/test to production. Digging deeper into container orchestration, we wanted to understand the scenarios in which the various platforms are being used. Knowing there was such a huge shift to production environments in the past year and seeing the impact that had on orchestration adoption above, we wanted to understand if there was preference for one platform over another as users make that move. For the most part, platform selection for dev/test is aligned with production. Focusing specifically on 2017 in this data set, we can see that Kubernetes, AWS and Azure usage all increased a few percentage points over their general adoption numbers when users were focused on production usage, with the largest number of users selecting Kubernetes. Stay tuned for more from our 2017 Bitnami user survey. Next time we’ll break down container orchestration a little further and look at mixed usage …we’re just getting started.